Beautiful Studio, located in the Recoleta neighborhood—considered to be the most elegant and upscale area of Buenos Aires — This ultra luxury apartment is just four blocks from the Recoleta Village. 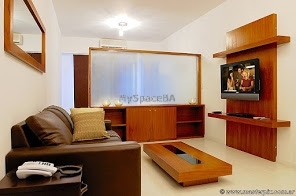 It is very spacious with over 538 sq. feet (50 sq. meters). The apartment gets plenty of sunlight throughout the day due to its location on the highest floor. The apartment is in a brand new building . It has a balcony. The apartment is located at the back of the building so there is no street noise. The bedroom has a King size Four Seasons Presidential suite mattress. The bathroom is high end using top quality materials. The kitchen is furnished with everything you would find in your home. Telephone, Luxurious Sofa , 32' LCD TV with Cable, Panasonic DVD Player (also plays CD's/MP3's). Custom made table with 4 chairs . Closet . Electronic Programmable Safe. Luxury custom made bar, Stove, Full size microwave oven. Refrigerator/freezer. Fully equipped with dishes, silverware, juicer, coffee maker, toaster, pots and pans, Tupperware, blender, and all cooking utensils. Air conditioning (Individual Temperature control for maximum comfort) . Private Balcony . Luxurious Marble Table with seating for 2. Wi-Fi high-speed wireless . Internet access. Landline phone with unlimited free local calls. Equipped with iron and ironing board. Extensive cable featuring several English speaking channels. Great and brand new building . Doorman 24hs. Swimming pool in the building. Laundry . In Recoleta, close to everything. Included: All the utilities are paid by the owner.